Going through the rooms of the Uffizi Gallery, it takes a while to find the first painting that doesn’t represent a religious subject. Exactly in the center of room 8, stands Piero Della Francesca Duke and Duchess of Urbino, a double portrait depicting Federigo da Montefeltro and Battista Sforza. The half-face portraits were made in 1467-70 and are a great example of the new realism introduced in Renaissance arts. The painter was born in Sansepolcro in 1416/17 and became one of the most famous interpreters of the Renaissance, specialized in representing a perfect linear perspective. He started his career as an apprentice of Domenico Veneziano, then traveled across Italy, working in Urbino, Ferrara, Bologna, Rimini and Arezzo. He was influenced by the Flemish painters he met in Northern Italy, at the same time he influenced the Northern Italian painters. During his stay in Urbino, he worked for the Duke Federigo da Montefeltro, a fine patron of the Renaissance, and his double portrait of the Duke and Duchess of Urbino was probably the highest point reached in this period of his life. With his realism (Piero represented the Duke and the Duchess as they actually were, without trying to idealize them), the painting reveals a lot of things about the Renaissance trends: the red cloth of the Duke, which was reserved only to the most rich and important families; the dress of the Duchess, with detachable sleeves (different for Summer and Winter) made of typical Florentine brocade; the hairstyle of the woman, which reveals how women preferred to show a large forehead, shaving out the hair on their front; the color of the skin of the woman, almost white, considered beautiful at that time, sign of distinction for noblewomen who didn’t have to work staying outside. Federigo da Montefeltro was an enemy of the Medici family; not directly, but because he was allied with Pope Sixtus IV, who helped the Pazzi in their conspiracy against the rulers of Florence. He lost an eye and broke his nose in a fight (hence the half-face portrait). 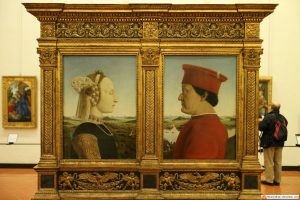 Ironically, the painting is on display at the Uffizi Gallery, in a building that was erected by the Medici family where they stored their collections. That’s because the Dukes of Urbino died out before the Medici did, and the last living of that family, Vittoria Della Rovere, married Ferdinando II Grand-Duke of Tuscany. She spoiled Urbino before moving to Florence, and we got this work along with many more by Raphael and Titian.